When the holidays are near and your business or event needs that extra traffic and sales, the simplest and most effective solution is a Holiday Feather Flag from SkyDancers.com. Proven with numerous customer feedback, Holiday Feather Flags give your establishment a boost with it's proprietary curved-top feather design that keeps the flag open, sturdy high-end material, and easy assembly and disassembly. Order one for every holiday of the year and be ready for those special dates. 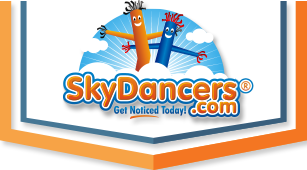 Don't enter your holidays without a SkyDancers.com Feather Flag and an advertising plan. We're sure you'll come back for more. SkyDancers.com Feather Flags can be ordered by just the flag or with a pole set as a complete set. Choose between the Ground Spike Pole Set for dirt ground installation or X-Stand Pole Set for flat ground installation. Order multiple flags to place in strategic point around your establishment for the most effective advertising plan. Customers have found that swapping in different flags regularly keeps their advertising fresh and new.